February 2019: 'V' = loVe For Yourself; February Citrus Challenge; Return of Vanessa Chalme, RD! November 2018: Holiday Season Helpers - Thanksgiving and Beyond, Recipe: Roasted Apple Pumpkin Soup; Beet Salad with Carrot, Quinoa & Spinach. October 2018: National Eat Better, Eat Together Month; Have Fear, Halloween is Near! ; Fueling for the New York City Marathon and Beyond! September 2018: Fall Fueling for Athletes, Marathoners...and Mere Mortals! ; September Recipes: Egg Breakfast "Muffins", Quinoa Bowls with Avocado, Curried Lentil and Vegetable Stew. August 2018: What Can I Do About Migraines? ; All About Fats! The "Good" & "Bad" Fats. July 2018: Food as Medicine; Veggies Never Tasted So Good!, Recipes: Broccoli Meatballs, Vegan Beet Burger, Vegetable Pancakes. June 2018: Water You Doing to Hydrate? ; Seasonal Produce Made Fun, Recipes: Strawberry Banana Chocolate Chip Baked Oatmeal, Strawberry Sorbet, Asparagus Fries. May 2018: Summer is Finally Here, Recipe: Grilled Veggies; Summer Hydration - Mocktails, Recipes: Mojito, Not So Arnold Palmer, Recovery Berry Colada. March 2018: Gearing Up For A Spring Marathon; March is National Nutrition Month; Meet Our New Dietitians. February 2018: Moms in Training; Grocery Delivery Services Tested and Reviewed; Meet Our New Dietitians. January 2018: 5 Nutrition Hacks for a Healthier 2018; Recipes for Nutrition Hacks, Recipes: Overnight Oats, Mason Jar Greek Salad, Curried Lentils Squash and Apple Stew. December 2017: Nutrition Energy Holiday Challenge; Immunity and Nutrition - a Win-Win Situation, Recipes: Italian Vegetable Soup, Cranberry-Oat-Nut Chocolate Chip Cookie. November 2017: Off-Season Nutrition for Athletes; Cheers to a Healthier Thanksgiving/Holidays Season, Recipe: Homemade Vegetarian Tofu "Turkey" with Vegetarian Stuffing, Garlic Cauliflower Mash. October 2017: The Marathon Days of Fall (and Running 26.2 Miles) are Here! September 2017: Lunch Meal Prep & Ideas, Recipe: Chicken Taco Salad in A Jar, Roasted Vegetable Quinoa Buddah Bowl; Energize Your Fall with Foods, Recipe: Pumpkin Spice Krispie Treats. August 2017: Everything You Need to Know About Iron; Breakfast - The Most Important Meal of the Day; Spotlight on Limor Baum, RD at NE. July 2017: Cauliflower Rice and Everything Spiralized, Recipe: Cauliflower Crust Pizza, Cauliflower Fried Rice, Chicken with Spiralized Zucchini, Asian Style Shrimp Zoodle Bowl; Athletes: Are You Properly Fueling Your Workout?, Recipe: Spicy Oven-Roasted Chickpeas, No-Bake Sweet & Salty Energy Bites; Product Review: Perky Jerky. June 2017: The Importance of Post-Workout Salt for Athletes, Recipe: PB & J Bites, Bloody Mary Mocktail; NE's 8 Top Tips to Get More Fruits and Vegetables onto Your Plate; The New Gatorade Endurance Formula; Product Review: Gatorade Endurance. May 2017: The Traveler's Guide to Healthy Eating; Resting Metabolic Rate (RMR): What is Yours and Why is it Important to Know? ; Welcoming Erin Melting to the NE Family; Product Review: ProBar Nut Butters. April 2017: Seasonal Allergies Giving You the Sniffles? ; Revving Up Your Post-Race Recovery with Proper Nutrition; Welcoming Caitlin Mattina to the NE Family. March 2017: Going Nuts for Nuts!, Recipe: Homemade Trail Mix; GERD, What it is and How to Prevent with Food; Welcoming Allie Matarasso to the NE Family. February 2017: Love Your Heart - NE Promotion; Foods We Love that Love You Back; February 22nd is National Cook A Sweet Potato Day, Recipe: Sweet Potato Casserole. January 2017: Setting Realistic and Successful Resolutions, Pre-Season Weight Loss for Athletes, Recipe: Crunchy Turnip, Apple, and Brussels Sprouts Slaw; New Online Payments. December 2016: Tips to End DECEMBER on a Fun & Healthy Note, Recipe: Egg Nog Smoothie; New Year's To Your Health Promotion. New Year's To Your Health Promotion: Check out Nutrition Energy's Holiday Gift Certificate Promotion to keep your health on track during the new year. Multiple types of gift certificates are available! November 2016: Athlete's Nutritional Transition to the Off-Season; Nutrition Facts or Myth: Thanksgiving Edition; How to Make Your Stuffing Healthier. October 2016: Spooky Fun Ways to Stay Active This October, Halloween/Sugar Quiz, Marathon & Endurance Sport Fueling. September 2016: Simplyfying Meal Prep/Back-To-School Lunches, Recipes: Hummus Pizza; Slow Cooker Butternut Squash, Bean, & Barley Stew; Honey - The Good, The Bad, and Athletic Uses, Recipe: Honey Roasted Cinnamon Almonds. August 2016: FODMAPs; What Are They? Recipe: Baked Shrimp Scampi (low FODMAP version); Gluten-Free Foods for Athletes. July 2016: Food is Fuel Part 2 (Protein Needs for Endurance Athletes), Recipe: Chicken Pad Thai; Race Day Nutrition Worksheet. June 2016: Summer of Love...for Balanced Nutrition; Food is Fuel, Recipe: Sweet Potato and Black Bean Quinoa Bowl. May 2016: Mindful Eating in May, Recipe: Lauren Antonucci's Chia Pudding; National Strawberry Month, Recipe: Chicken Cutlets with Strawberry-Avocado Salsa. April 2016: Health & Wellness Spring Cleaning, Recipe: Almond Butter,Strawberry & Banana Overnight Oats; Spring Into Running - NE's Top Foods, Recipe: Spring Thyme Frittata. March 2016: March is National Nutrition Month, Recipe: Popcorn Cauliflower; 'Spring Training' Workout Series; Moms in Training. February 2016: Investing In A Slow Cooker, Recipes: Honey Garlic Chicken and Veggies, Vegetarian Chili; February is Chocolate and Heart Health Month. January 2016: Updates to Nutrition Energy; Meet Our New Dietitians; New Year's Resolutions Done Right; Sea Vegetables: A Nutrient Powerhouse. December 2015: Top 5 Tips to Enjoying Holiday Parties 'Healthfully'; Traditional Holiday Favorites Made Healthy, Recipe: Hanukah Latkes, Black Bean Dip, Avocado Yogurt Dip. 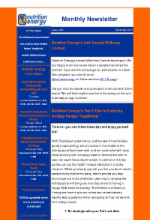 November 2015: The Wellness Contest is back! ; Nutrition for the Holiday Season; Bone Health, Recipe: Green Tea, Blueberry, & Banana Smoothie; NYC Meal Delivery Services #5. October 2015: TCS New York City Marathon Prep; Apple Benefits, Recipe: Butternut Squash & Apple Soup; NYC Meal Delivery Services #4. September 2015: Pickles! History, Nutrition & The Quick Pickle Kit (found on Amazon! ); Salt and Exercise & Salt Stick; NYC Meal Delivery Services #3.